Clearly our bellies are thanking Paul for being home since I’ve taken to cooking all weekend. 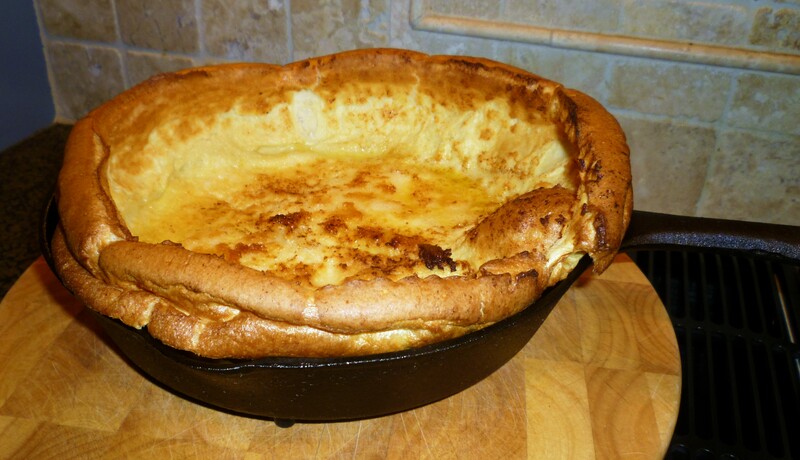 Growing up, my mom used to make me a Dutch Baby, a cross between a pancake and a popover, at least once a week before school and it was always my absolute favorite. Using an old and very well seasoned cast iron pan, she always turned out the perfect breakfast again and again. So, with a cloudy and overcast morning greeting us and fresh homemade strawberry jam canned last night; it seemed the perfect time to re-create an awesome comfort food breakfast for the family before Paul departs this afternoon. I don’t have my mother’s recipe and I know that this one varies from her version, but it does well to stand on its own against the one I remember growing up. Maybe the next time she visits we can have a Dutch Baby cook off, Iron Chef style! Bring it Mom! This recipe could not be more basic and easy to execute as long as you have a seasoned cast iron pan. Don’t have one, have no fear… they are readily available in most big box stores and online. Now, go on and make yourself a breakfast that will warm your heart and feed your soul! Place skillet on middle rack of oven and pre-heat oven to 450°F. Beat eggs with an electric mixer or by hand until pale and frothy, then beat in milk, flour, vanilla, cinnamon and salt and continue to beat until smooth, about 1 minute more (batter will be thin). When oven is heated, add butter to hot skillet and melt, swirling to coat. Add batter and immediately return skillet to oven. Bake until puffed and golden-brown, 18 to 20 minutes. Serve immediately, topped with powdered sugar, maple syrup, fresh jam, or whatever your heart demands! Dutch Babies are such a great breakfast. Simple, nutritious and delicious! If you have guests over, you could probably double your recipe and still get good results in the same size skillet. Thanks for the recipe and I love your blog! For me, my Dad use to make us Fried Dough on Sundays when he wasn’t working – a great memory. Thanks for sharing yours. We were introduced to Dutch Babies when we lived in IL. They are delicious! let’s run away together….between your cooking and my cupcakes we could be quite the power couple 😉 btw, I make raspberry jam that is amazing-I just wish GA was more of a ‘berry’ state.